A trigger provision, buried in U.S. laws since 1990, quietly took effect at the end of October. The U.S. taxpayers' annual donation of 22 percent to the United Nations Educational Scientific and Cultural Organization's budget was summarily terminated when UNESCO voted 107 to 14 (with 52 abstentions) to approve full membership for Palestine. The cutoff of U.S. handouts includes not only our major annual gift to UNESCO of $80 million, but also some extra-budgetary donations of $2 million and $3 million a year for special projects, mostly in Iraq. The Palestinians can now request admission to three other U.N. agencies and, if accepted, U.S. law will require us to terminate our handouts to those agencies, too. For example, U.N. Secretary-General Ban Ki-moon, speaking in Bangladesh on Nov. 14, urged world leaders to finalize financing for a multibillion-dollar fund to fight the effects of climate change. He is urging the U.N. climate-change conference that opens Nov. 28 in Durban, South Africa, to raise $100 billion a year for a Green Climate Fund to help poor countries cope with global warming. Americans should recognize this language as U.N. gobbledygook to transfer U.S. wealth to foreign countries run by corrupt dictators. The 190 countries expected to attend the Durban conference would probably think that is a nifty idea. 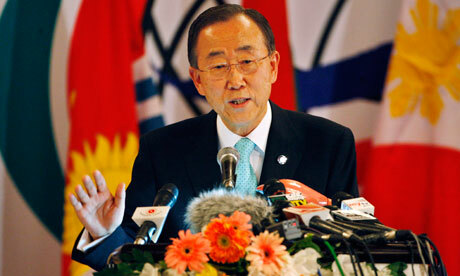 Ban Ki-moon started his drive for a huge U.N. climate-change fund by making a tear-jerking plea, about a melting North Pole glacier, at the Copenhagen U.N. conference in December 2009. But despite President Obama's attendance, designed to encourage U.N. wishful thinking, Copenhagen results were zero. The U.S. never ratified the Kyoto Protocol, which was signed by Bill Clinton, but our Senate did ratify the U.N. Framework Convention on Climate Change in 1992. This UNFCCC created a committee charged with designing a Green Climate Fund, which was supposed to develop a plan to raise $100 billion a year, and get it approved at the UNFCCC meeting to be held in Durban, South Africa next month. The Cancun Agreements, adopted at the U.N. Climate Talks in December 2010, established the Green Climate Fund. Cancun also set up a committee charged with making recommendations to the Durban conference. The committee hasn't yet made progress with the plan to get guarantees from developed countries, i.e., the U.S., to take action domestically and, collectively, to pledge the money. The current strategy is for the poor countries to use the Durban, South Africa conference to demand that the developed countries ante up $100 billion annually by 2020. The scariest part is how the committee, consisting of representatives of 40 nations, plans to get the $100 billion a year. No plans have been finalized, but the committee is hoping for U.N. taxes on carbon, international travel and shipping, international financial trades of stocks, bonds, derivatives and currency, and a wire tax for producing electricity, plus eliminating individual country subsidies to fossil fuels and diverting that money to the Green Climate Fund. The strategy behind this potpourri of special taxes is, first, to bypass Congress, realizing that even our big-spending politicians are not stupid enough to vote for a U.N. appropriation of such magnitude. Second, the amount of money that could be raised by these special taxes paid by individuals and corporations could reach or even exceed the extravagant goals of the Green Climate Fund. We should prepare ourselves for this by using the UNESCO model. Congress should pass a law specifying that if the U.N. imposes any taxes to be paid by individuals or corporations, that's the day we terminate all U.S. appropriations to the U.N.
Maybe these U.N. tax-hungry globalists will get some help from the Occupy Wall Street bunch for the plan to tax individuals instead of relying on congressional appropriations. One OWS leader just demanded "a 1 percent Robin Hood tax on all financial transactions and currency trades."